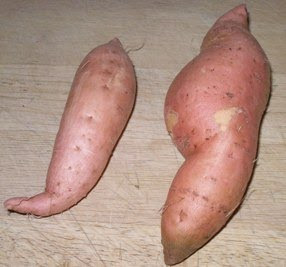 I've been blogging...errr...'bragging' about my sweet potato plants [in pot] here in the past. In case you have no idea what I'm talking about, here's a picture of my 'vegetable [pot] garden'. Let me just say, these sweet potatoes made my lunches [and sometimes dinners] so satisfying I will forever be grateful to them....tee hee. BUT...they served their purpose already so some drastic measures had to be done. You see, I wasn't able to plant them on the ground simply because I can't find a good place to plant them. I know how easily they grow and spread and I'm afraid they may take over the yard that the husband has been so passionately taking care of. So sad as it may seem....I had to uproot them from the pots straight to the trash. I totally forgot that kamote also bear fruits! Toink! I was so focused on the LEAVES that's why. It was a pleasant surprise needless to say....anybody want some kamote-cue???? gawin ng camote-q yan hehehe.... sarap naman! yung ibang pot walang kamote? what a nice surprise! yung basil ko, mukhang mamamatay yata kahit nasa loob na. mukhang hindi kaya ang lamig dito. looking forward to E's Halloween look. sana lang hini umulan diyan. Manyaman yang Camote-cue! :) Galing! I want to start planting too... Sana hindi lang mamatay. Never tried it yet... Maybe, it's about time!